Diebold Nixdorf has signed with Emirates NBD to bring consumers in the UAE access to its digital kiosk that offers a variety of banking services, writes Julie Muhn at Finovate. The bank has called the kiosk EasyHub, and the capabilities go far beyond a typical ATM. This kiosk allows customers to conduct many of the activities they would typically do in a brick-and-mortar bank, all outside of bank operating hours. Users interact with a video teller and follow written instructions on the screen to sign up for new products and services, apply for and receive a new debit card, update their personal details, request a chequebook, authenticate statements, and even apply for a personal loan. 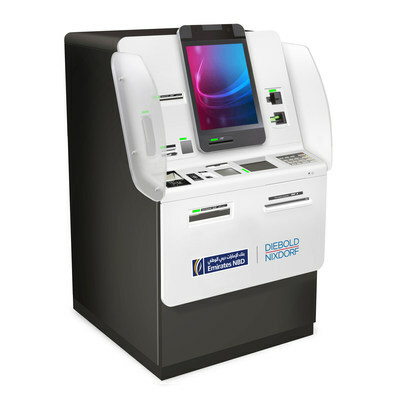 Diebold Nixdorf’s Vynamic Connection Points, a multi-vendor software allowing for customised applications, is powering the EasyHub kiosk. The device comes with a debit card dispenser, biometric signature pad, document scanner, statement printer, ID reader, cash recycler and coin dispenser, and an NFC reader for contactless transactions. Abdulla Qassem, Emirates NBD’s group COO, cites EasyHub’s customer-first approach, increased flexibility, and superior service among the benefits of teaming up with Diebold Nixdorf. Founded in 1859, Diebold Nixdorf works with almost all of the world’s top 100 banks and most of the top 25 global retailers. Diebold Nixdorf is headquartered in Ohio, US, and has 23,000 employees across the globe.